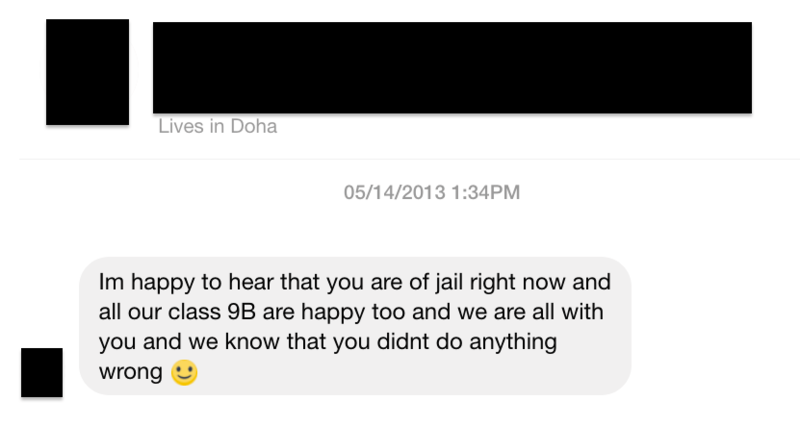 Returning to Nepal following the twelve-day ordeal in a Qatari jail, I was greeted by a lot of messages, emails, request for connection on social media. Not surprisingly, only a small number had come from Qatar Academy (QA) students. 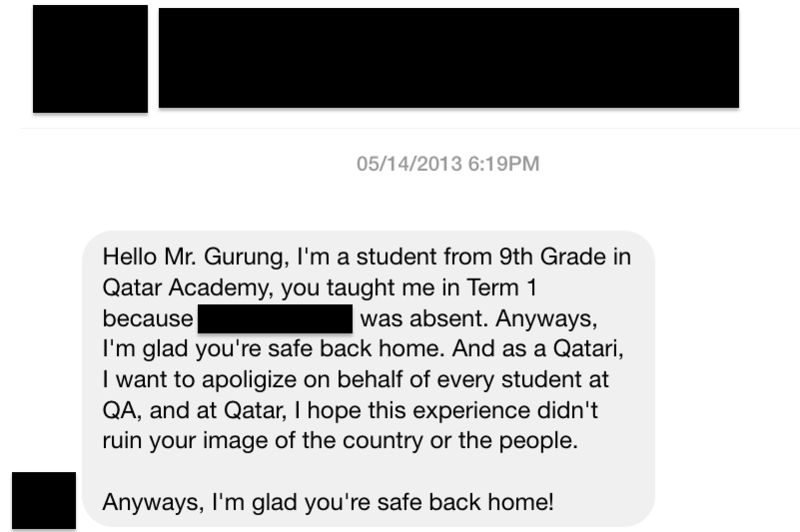 After all, pretty much every student I had known at QA were teenagers. More than anything, most were probably just shocked and didn’t know how to respond or how to reach out etc., all of which of course is completely understandable. Again, they were — and some still are — just teenagers. One former student however had been very courageous and posted a lengthy comment under the change.org petition explaining why he had signed the petition, which touched my heart. An email from a colleague describing how some of the students apparently signed the petition “20 times” also touched my heart!! I suspect the following two private messages came from two of those who signed the petition multiple times. There were some really surprising emails and messages waiting for me too. A few just bizarre. But the two most surprising or bizarre ones came just days after my arrival in Kathmandu. The first was a Facebook friend request from the student who had led the taunting and harassment and whose father had started the ball rolling with the unceremonious firing from my job followed by the incarceration. 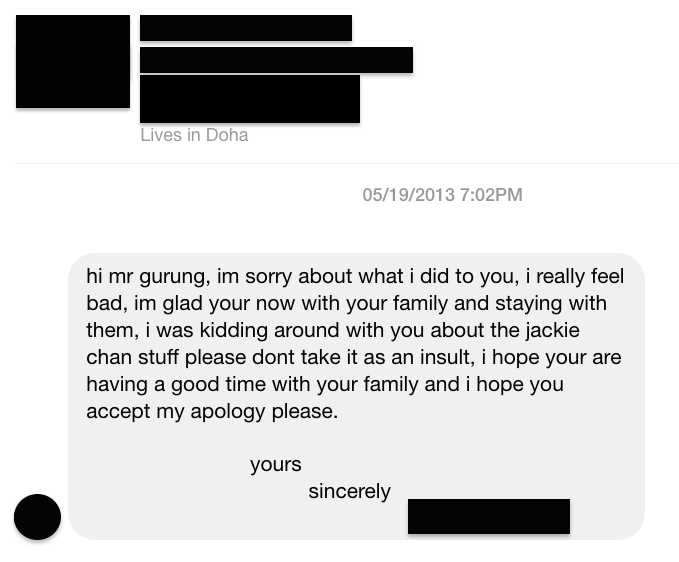 The second surprise, a private message of apology also from the same student. He had sent it just a couple of minutes after the friend request. To me, it appeared as if an adult had helped him draft it. Realizing that there must be more to it, I shared the details of the apology with friends still at QA. As I have said elsewhere, I didn’t know anything about the students and his two friends. The exchanges with QA friends produced some details about them. For some time until the incident had occurred, preparation had been underway to expel the three boys at the end of that academic year. Maybe — MAYBE — the father blew the incident between his son and I out of proportion to somehow use it as a bargaining chip when the question of his son’s expulsion would come up! Expulsion from the prestigious school would have been a huge source of embarrassment for him and his family. To prevent that loss of face, he may have taken the drastic steps — of getting me fired and jailed — with hopes of leveraging it, somehow. In other words, he took steps to destroy my life — and possibly that of some of those connected to me — to save his face. I suppose, to him, the life of a Nepali, who is at the bottom of the totem pole in Qatar, is of less value than his social standing within his community. The afternoon I was released, the secondary school Principal did tell me how I should thank the Vice-principal for getting the father to drop the charges. (Colleagues, however, had been told that the charges were completely out of the parent’s hands.) My own analysis points to the unlikelihood of that being the reason for my release. Information I have also says that the charges are still pending. Regardless, be that as it may, after dropping the charges, could the message from the student, with help from an adult, have been part of a deal between the school and the parent to keep the student in school? Did the student get expelled from school? I don’t know. Did I care whether he was? I really didn’t. I didn’t wish him any harm or pain. I rarely thought about the boy and his friends except when relaying the story behind the traumatic experience. Besides, more than him, his father was to blame really, if blame could be placed on an individual for my suffering. But would I wish that kind of pain and suffering on the father? No! I wouldn’t wish it on anyone. To reiterate something I have said elsewhere, wishing direct pain and suffering on others, or causing direct pain and suffering on others, does not alleviate ones pain and suffering.